After a one season hiatus, we're back at the fairgrounds! Ben has assembled a course that co-exists peacefully with the RV campers, weekly flea market, and maintenance staff, yet utilizes all of the varied terrain options the fairgrounds has to offer. Check the map to the right for the most recent incarnation and note that access to the venue is via the Horse Show Service Gate as opposed to the main fairgrounds entrance. Volunteers receive a free race entry, or if not racing, one for a friend. Contact Rick Ortenblad via our contact page to help out. Thanks! 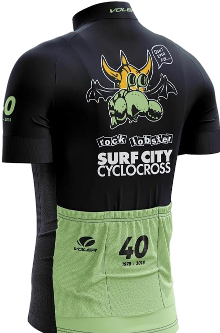 Designed by Ian Stowe, printed by Jakroo, jerseys and shorts can be ordered via the Jakroo webstore as well as at the races. Ordering at the races gets you a 25% discount and a chance to check out display samples. Sign up for all three races and save $20 in the process with a series pass.